Larry King, via Facebook, denies claims that he has been hired by the American branch of RT TV channel. According to Larry King, RT has not hired him, but bought the rights to be the exclusive U.S. broadcaster for his show “Larry King Now.” The show will still be available online at Hulu.com and Ora.tv (the latter was co-founded by King himself) – and now RT.com. 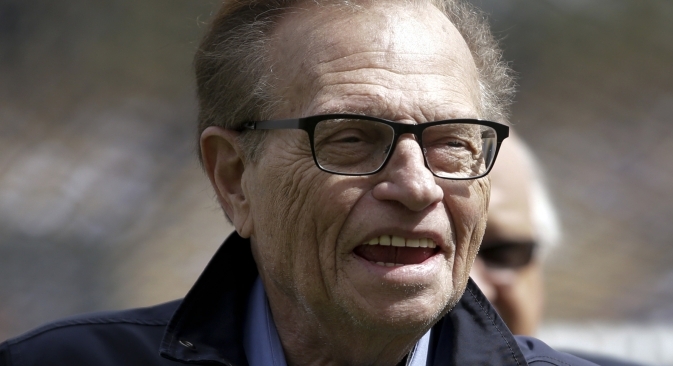 On May 30, an announcement on Simonyan’s Twitter (which read: “Larry King is working for us now”) caused fierce discussions both in Russia and the U.S. and also led to speculations on the sum of King’s contract. Margarita Simonyan, chief editor of RT, confirmed on May 31 that the Russian news channels had not hired Larry King officially. “Of course, we haven’t hired him: We didn’t get any quota for him, didn’t get work permission, we’re not his tax agent,” said Simonyan. According to Ora.tv and King himself, the second show will also be produced by Ora.tv. “RT is airing the shows, without any editorial oversight — whatsoever,” wrote King on his Facebook page. Both programs will be recorded in RT America’s studios in Washington, D.C., and Ora TV’s studio in Los Angeles.